This is another one of my no-boil pasta dishes. I am officially obsessed with this cooking technique! 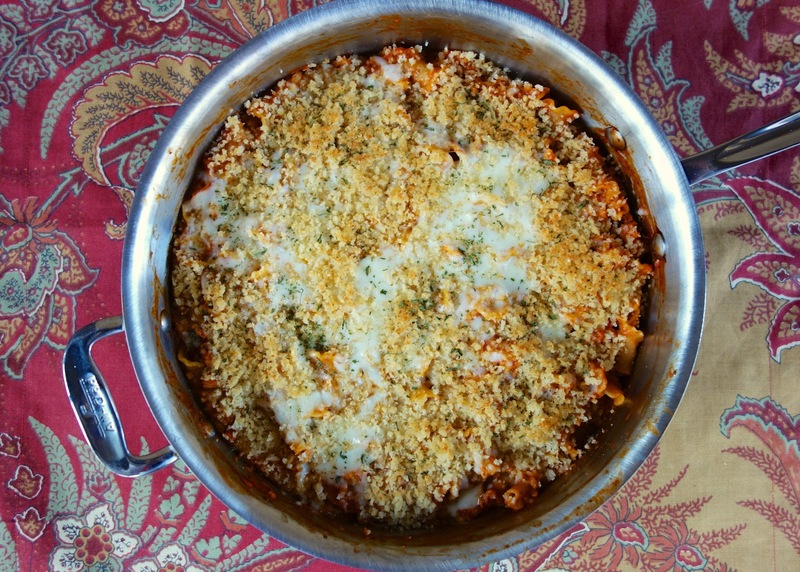 This no-boil pasta is my take on Chicken Parmesan Pasta. 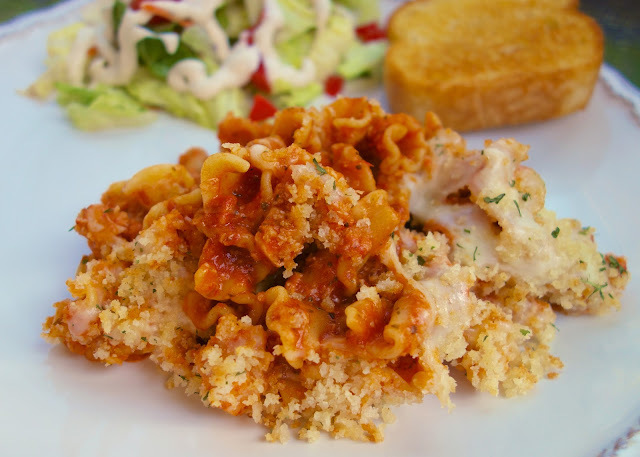 It has all the flavors of Chicken Parmesan without the frying. I used chopped chicken in the pasta and added some bread crumbs and mozzarella cheese on top. It was SO delicious! This makes a ton and is very filling. Plan on feeding a crowd or having leftovers for lunch. In oven-safe skillet, combine pasta, sauce and water. bring to boil. Cover and reduce heat. Simmer for 15-18 minutes, until pasta is tender. Stir in chicken and 6 Tbsp parmesan cheese. Cooke over low heat about 5 minutes. Top pasta with mozzarella cheese. Combine panko, melted butter, remaining parmesan and garlic powder. Sprinkle over mozzarella cheese. Heat under broiler until bread crumbs are toasted and cheese is melted. I have been dying to try one of these pasta recipes. Looks great! I'll try it this week since I have a bunch of smoked chicken in the freezer that we made up just for dishes like this. A keeper, for sure! 1 question, though: when do the red pepper flakes go in? We enjoyed this dish for dinner tonight. I was doubling it to take a couple dishes to my in-laws so I didn't complete it in the skillet, but other than that I followed the recipe. Very yummy and kid-friendly. Made this for dinner tonight using whole wheat rotini. Surprisingly, I could have cooked the pasta a few minutes less than the 15 minutes, but it was still delicious. We'll definitely have this again.